We rather take spiders for granted. We are all aware of them in our homes and gardens; some people like them, some people loathe them. But they really are amazing animals with some extraordinary abilities. Like producing silk; supposedly the toughest natural fiber in the world and as strong as steel. They have also been around for 380 million years, so they deserve some respect for longevity at least. Along the way, they evolved spinnerets and the ability to spin complex webs. Capturing prey in this way has kept them in business ever since, and it is fascinating to look carefully at how they do this. 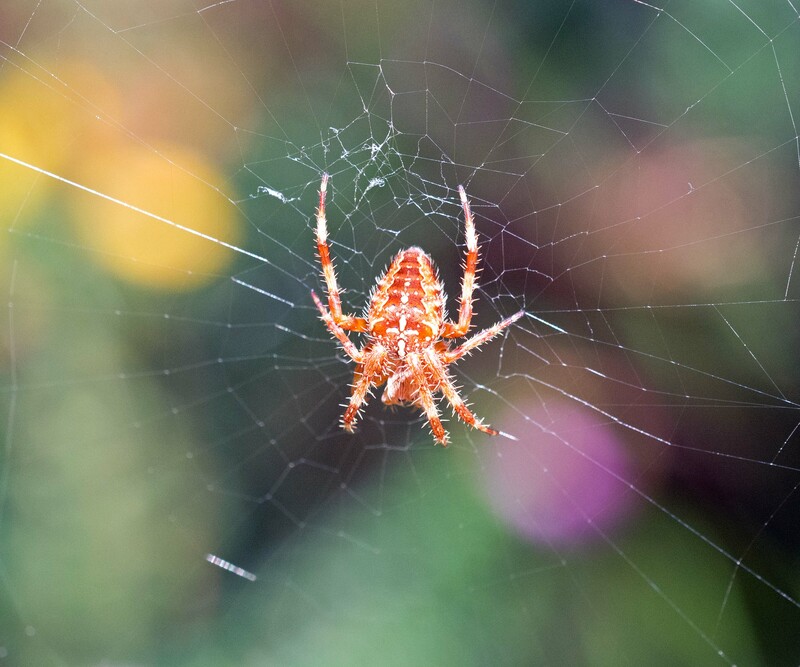 The orb-web, or spider’s web, serves a variety of purposes: firstly, it supports the spider and allows it to move about in 2-D space; secondly, it transmits mechanical impulses; and thirdly, it is a superb net for catching flying prey. 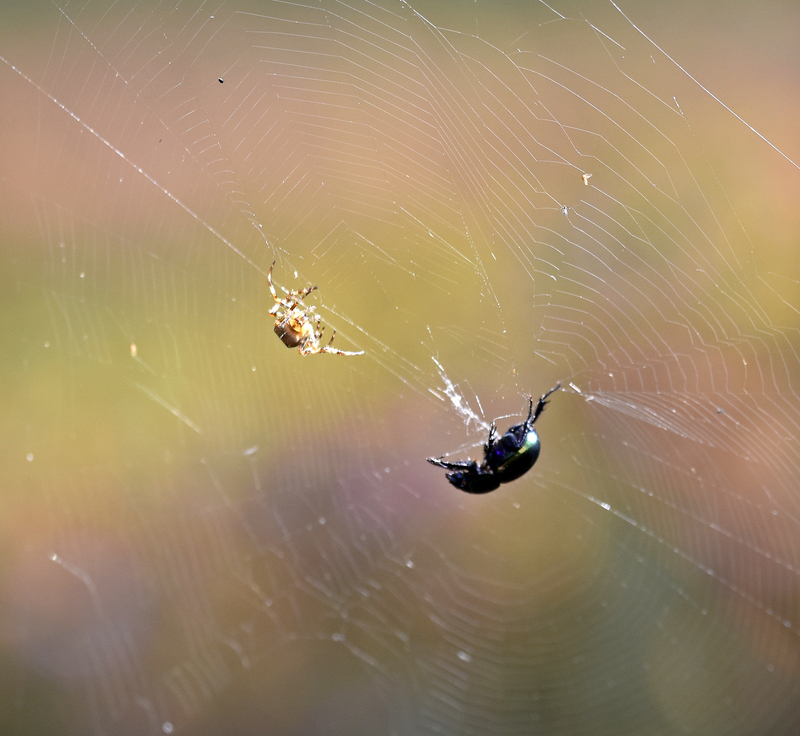 When the prey item is caught up in the web, the spider has to quickly locate it and subdue it, so that it cannot escape. Sometimes, the easiest way to immobilise it is to bind it up in silk. When a spiders bites its prey, it does so with a fang attached to a venom gland, and thereby injects it with venom. This both immobilises the prey and initiates the process of digestion. 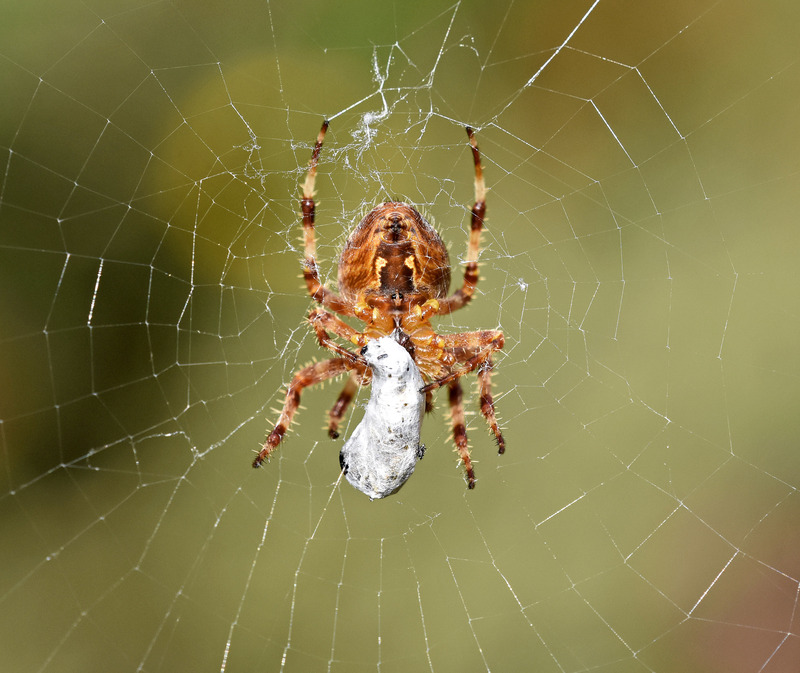 Wrapping by araneid spiders usually occurs at the feeding site – the hub of the web – if the items are small enough. They are pulled from the web at the point of capture and carried to the hub in the jaws of the spider, where they are wrapped up (Robinson et al., 1969). 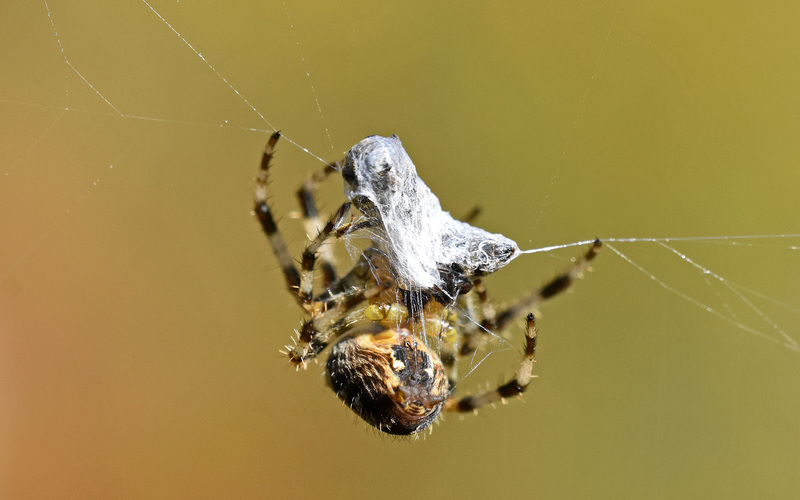 Many orb spiders are seen sitting in the centre of the web holding a wrapped prey item (see below). It’s rather macabre to think that it might still be alive. Larger prey which are wrapped at the capture site (before or after biting) are similarly, subsequently carried to the hub in the jaws of the spider and re-wrapped. This is called post-immobilization wrapping at the feeding site (Robinson et al., 1969). 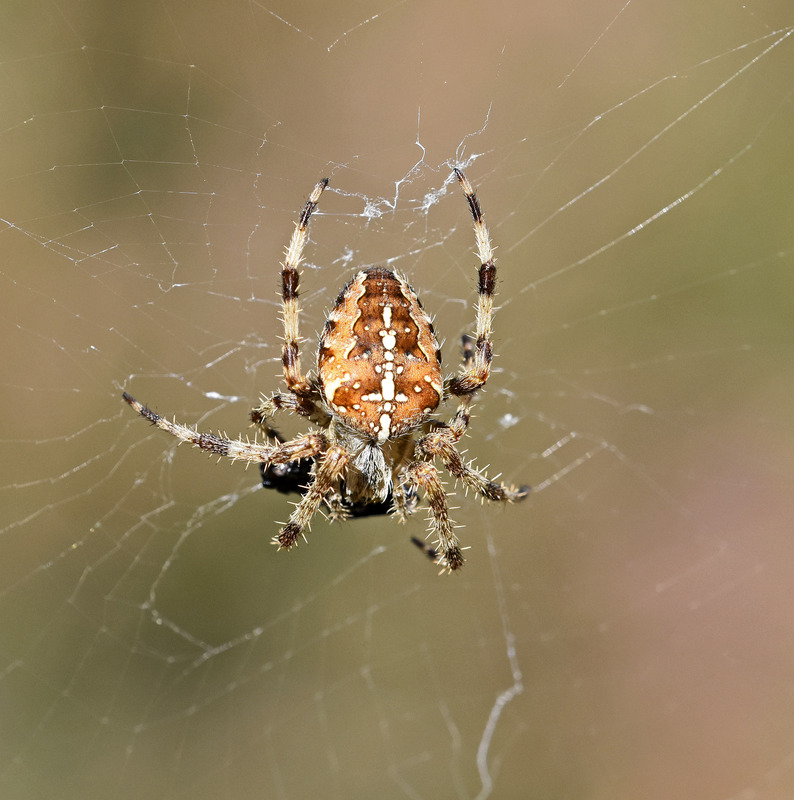 Orb web spiders are said to be nocturnal, eating their packets of food at night. But they can be pretty active during the day as well, especially if they catch a lot of prey. 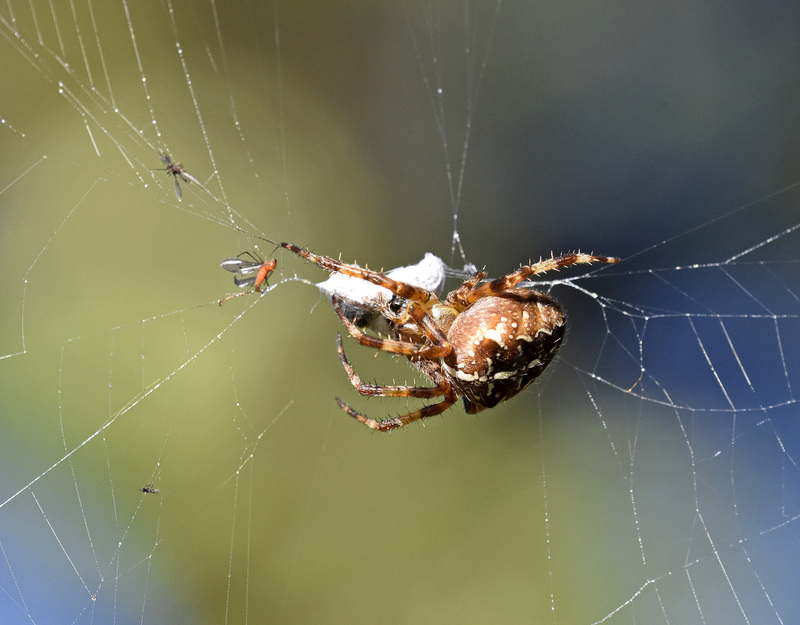 Orb-weaving spiders usually replace their web every day; a huge investment of energy and silk, although they usually consume the web to obtain the valuable protein it contains. It is thought that they can adjust the size of the web, and the spacing of the mesh, to take account of the availability of prey in the area. There is something of a trade off to be had between the size of the web and the density of the mesh. Bigger webs increase the probability of capture because they are sampling a large unit of space, but denser – narrow-meshed – webs are much more likely to catch large insects (Blackledge & Eliason, 2007), which presumably escape if they are not sufficiently entangled. They must also capture more of the smaller insects which would – hopefully! – fly through a web with wide mesh. 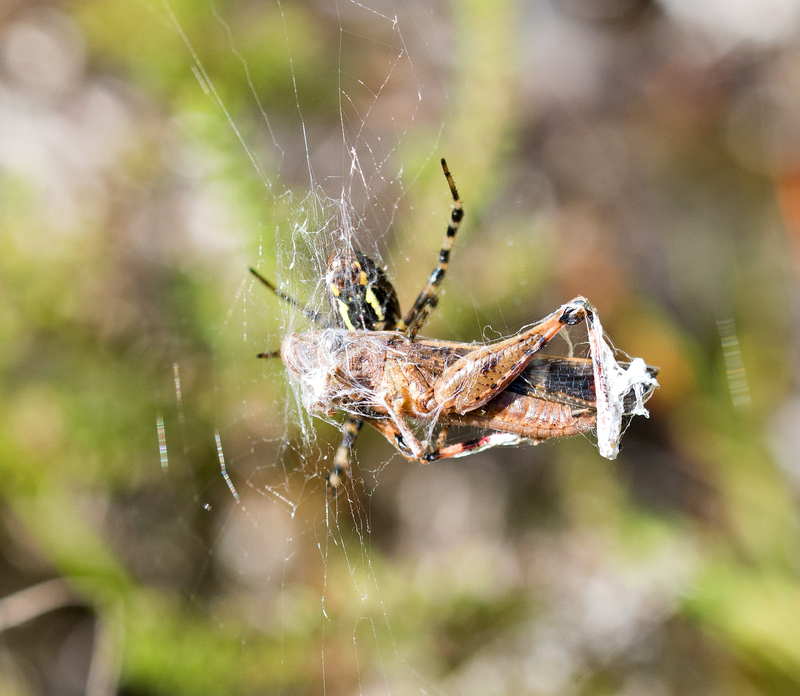 Large prey items, even though they are rarely caught compared to smaller insects, are essential to the survival and fecundity of the spiders; they cannot survive or produce eggs without catching these large but rare prey items (Venner & Casas, 2005). I have not witnessed it, but apparently, spiders like these also take down their webs – presumably by consuming them – if it is windy. Partly to save them from being blown away, but also because they are just less efficient as wind speed increases. In certain locations, they must have to continually rebuild their webs as large animals, cows, sheep, humans and so on, blunder through them. They take a certain time to refill their silk glands, usually about 24 hours, and until they do, rebuilt webs are likely to be smaller. 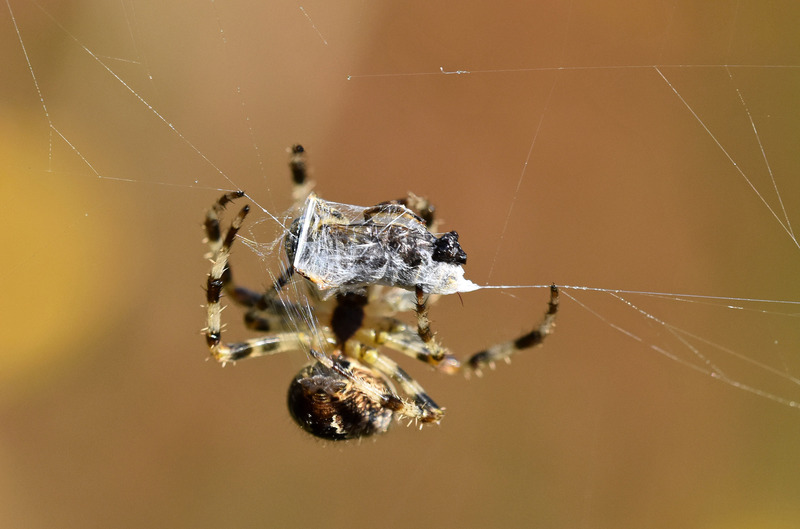 Orb weavers in the genus Argiope usually bite, then wrap, then eat their prey later; most araneids wrap up their prey before biting it (3). This is especially the case if the prey item is potentially dangerous, like a bee or a wasp. Better to wrap it up first and subdue it. Prey capture and handling techniques in spiders are thought to have evolved from “biting, without the help of a web, to using a web and then biting, to using a web, biting and then wrapping, to using a web, wrapping first and then biting, and finally to using a web and rotating while wrapping before biting.” (2) The process of rotating the prey whilst wrapping it in silk, is a wonder to behold and I was lucky enough to capture a spider doing just this (see photos that follows below). 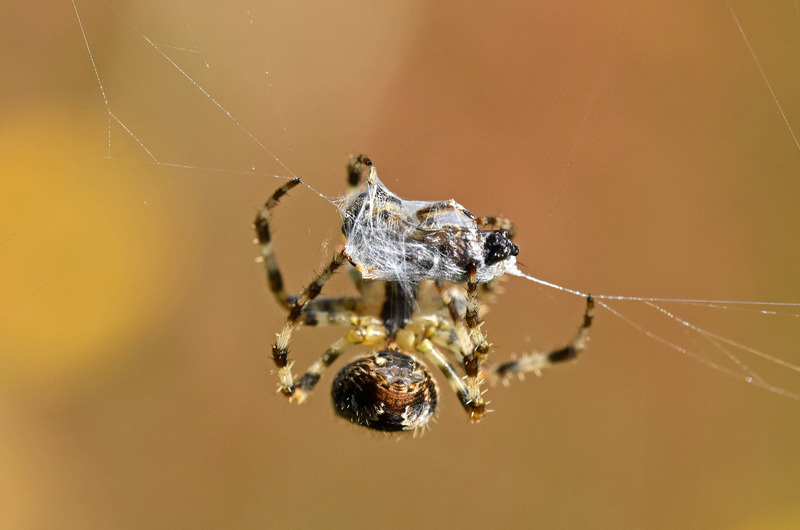 The prey is juggled by the spider with its legs – spinning it round and round and encasing it with silk. The prey appears to be anchored by two stout silk lines and is spun on these as the spiders wraps it in a mesh of fine silk extruded from its spinnerets. I find it faintly disturbing to think of all these poor creatures, snatched from their lives and trussed up like mummies before they know what has happened almost! But like much of nature when you look closely, it is not pretty, just a timeless struggle to survive; and one creature’s loved one is another creatures dinner! Blackledge, T. A., & Eliason, C. M. (2007). 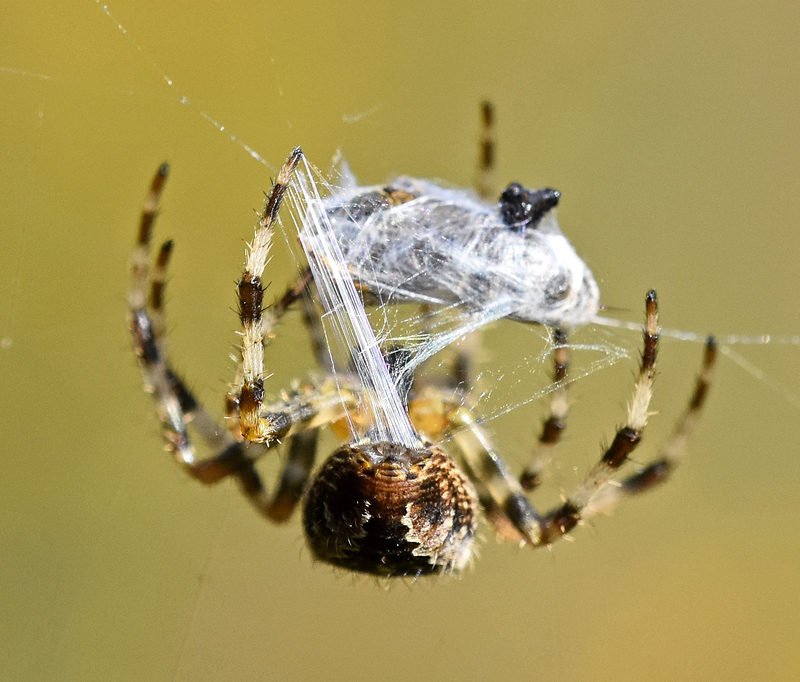 Functionally independent components of prey capture are architecturally constrained in spider orb webs. Biology Letters, 3(5), 456-458. Robinson, M. H., Mirick, H., & Turner, O. (1969). The predatory behavior of some araneid spiders and the origin of immobilization wrapping. Psyche, 76(4), 487-501. Venner, S., & Casas, J. (2005). 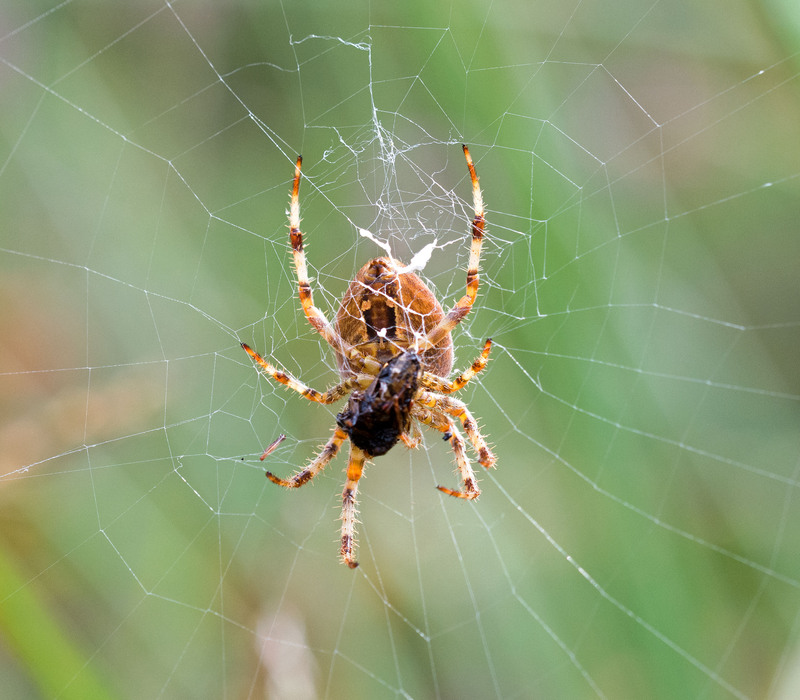 Spider webs designed for rare but life-saving catches. Proceedings of the Royal Society of London B: Biological Sciences, 272(1572), 1587-1592.